Our local Bar and General Shop, it carries a handy selection of general food items and has just installed a lovely terrace bar behind the café. Where you can join the locals or take a secluded seat and enjoy the view. Mari Chiara’s is a 15 minute walk, or 5 minutes drive downhill from “ La Collina del Sole ” or you could walk cross country which will require a good pair of trainers. Follow the pathway outside the house going left and follow through the village of Fosciandora and continue downhill keeping the Migliano church tower in view. Castelnuovo is a 15 minute drive from “ La Collina del Sole ”. It is best to park either in the main car park outside the main walls of Castelnuovo di Garfagnana or the car park in the Piazza delle Erbe. Both car parks are pay and display and are reasonable rates. Located just outside the Castelnuovo museum. 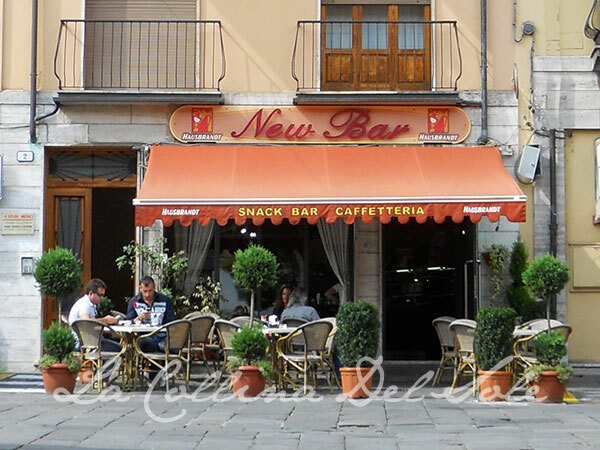 This “Antica Pasticceria” Fronte della Rocca, was founded in 1885. They have a secluded sitting area and make their OWN CHOCOLATES, including edible liquer cups, cakes and pastries. It is run by a charming young couple, he makes the pastries and chocolates and she looks after the clients. Nice to sit and ponder on Ariosto’s’ time here, a well known figure of Italian literature who governed the area in the 16th Century from the building opposite you for several years; he was sent here by Alfonso Duke of Ferrara.